All tools/scripts/programs here are freeware. They are related to the PHP-GTK, an extension to PHP which provides Window-functionality to PHP - you can create Desktop PHP-Applications. For more information about PHP-GTK and other applications, see gtk.php.net. 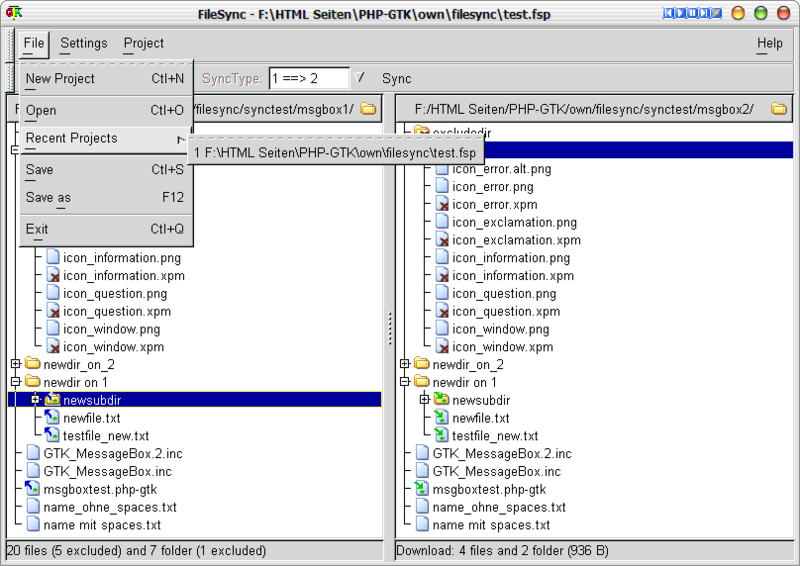 FileSync is a tool for syncronizing the contents of 2 directories. 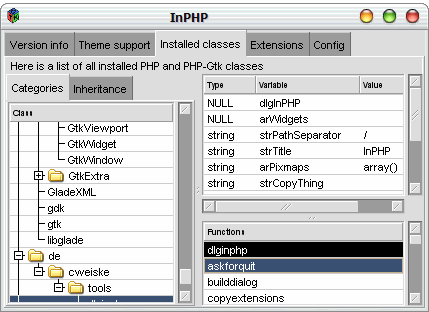 With InPHP you can explore the world of PHP and PHP-GTK. 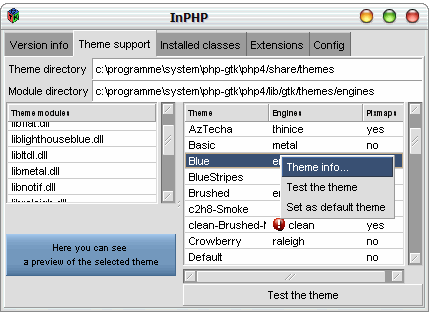 It shows you the version information of your PHP installation, lists all available GTK themes and displays all known classes, functions and extensions of php. You can test the themes directly by double-clicking the corresponding item in the theme list, copy whole function lists and a bit more. Renames mp3 files according to a user-definable pattern; mp3 id3-tag information can be used for this. E.g, you could rename all the mp3s to "[artist] - [album] - [tracknumber] - [title].mp3" with a few clicks. Utilizes the mp3info tool by Cedric Tefft. Does NOT work on windows! You're using php scripts with the PHP-GTK? Then you always have to launch php.exe with the file you want to start, like c:\Programs\php\php.exe "c:\scripts\application.php". Older versions of the php_win.exe shipped with the php-gtk searches for the php.exe just in c:\php\php.exe, c:\php4\php.exe, %PATH% and the PHP_BIN environment variable. 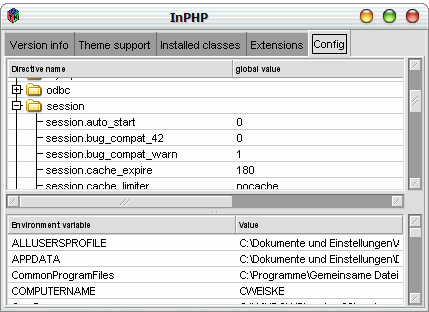 If you didn't set the environment variable and have a different php directory, php_win.exe won't find php. This php_gtk.exe looks for php.exe in it's own directory - no problem with "php.exe not found" any more. 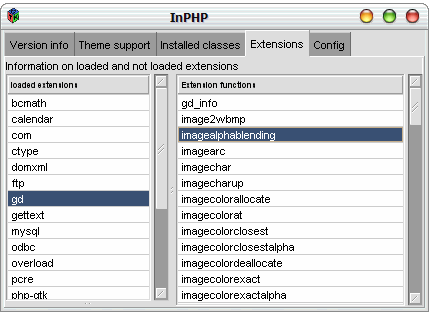 It also has several icons for php-gtk files included. And you can easily register php-gtk files with it! You can run the script with 8 extra parameters now. 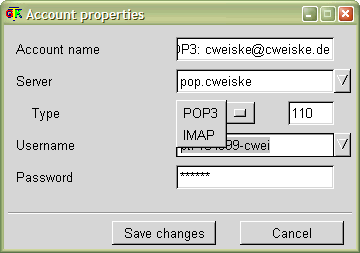 A small tool which checks POP3 and IMAP accounts for mails. 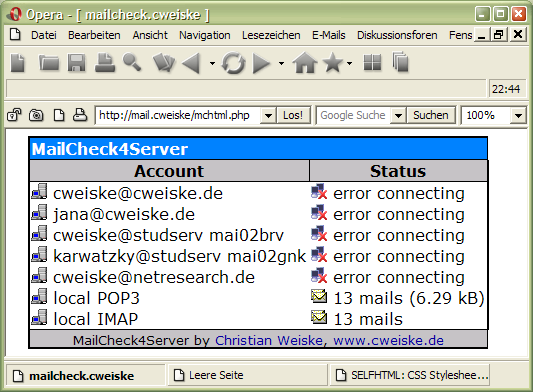 Checks POP and IMAP mail boxes for mails - server-sided! This means, you run it on a normal HTTP-Server with PHP installed. Just copy your "mailcheck.xini" into the same directory, this settings are used. Open your browser, type "http://www.yourserver.com/path/to/mailcheck/mchtml.php". This small tool scans a given directory for artists, albums amd mp3s. It it assumed, that the directory structure is like the one on the picture. The script collects information on the number of CDs, mp3s and .txt files. After scanning, the data are written to a .csv file which you can open with Excel. Massload is for loading multiple files from a remote address. E.g., all RFC's can be located at http://www.faqs.org/ftp/rfc/rfcXXX.txt. With massload, you can easily get them all without have to type all the numbers by yourself. It supports an unlimited count of numbers to change, number ranges and stops - if you want - if there is no more file to get, even if the range specifies more. It has a file size checker, which deletes all downloaded files which are smaller than you thought they would be. Last but not least, it supports referrers. 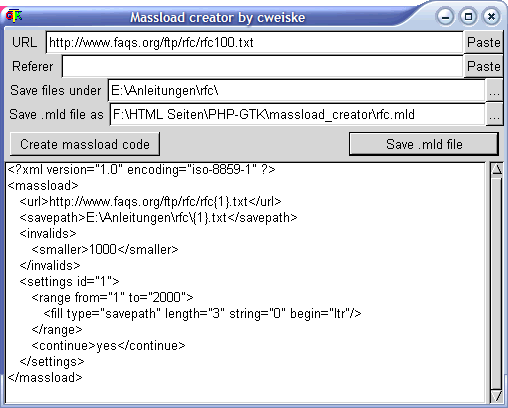 Included is the MassLoad Creator, with whom you easily can create the massload files. As I couldn't find any working wireless network tools which just show the currently available networks, I decided to write my own one. Now it does what it was supposed to do: List available networks, with data like signal strength, encryption status and connection speed. You can't see it on the screenshot, but there is a button to connect to the selected access point.